The GA announcement of MySQL 5.1 is coming, and for downloading, it's already available, as I hope you have noticed from Giuseppe's blog. 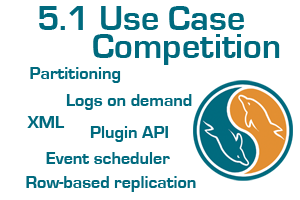 We continue our preparations, this time by announcing Position 2 in the MySQL 5.1 Use Case Competition. 2. Guy Adams (Parallel Ltd., Milton Keynes, United Kingdom): Using Partitioning to Manage Satellite Networks. See Guy's DevZone article. Thanks and congratulations, Guy! I hope you too are in a position to take advantage of your free MySQL Conference & Expo 2009 Pass, including a dinner with MySQL co-founder Michael Ã¢â‚¬Å“MontyÃ¢â‚¬Â Widenius.